The Association of Landscape Contractors of Ireland (ALCI) represents Landscaping Contractors all over Ireland and is committed to the development of the landscape industry by ensuring quality of workmanship, best practice, reliability and emphasis on training. It recognises the excellence of landscaping across various categories achieved by its members through the annual all-Ireland Awards which have been running for over 30 years. 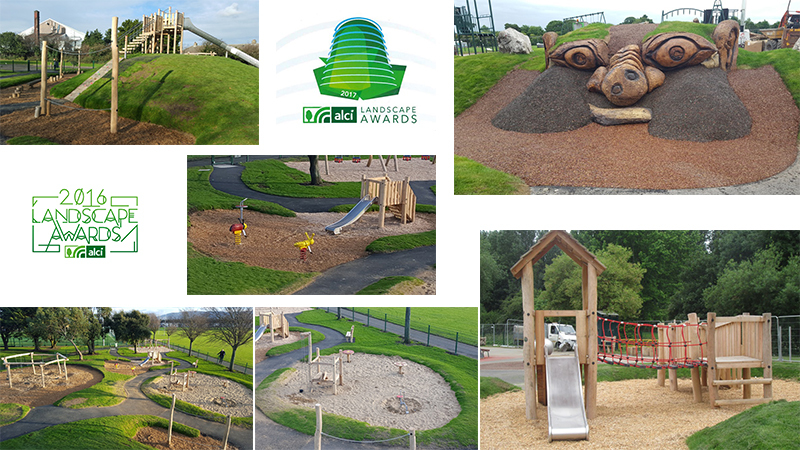 In 2016 & 2017 Creative Play Solutions won the ALCI Award for our design and installation of playgrounds in Willie Pearse Park and Griffeen Valley Park, both based in Dublin. Both projects were design and build and the client requested a natural playground to complement the surrounding landscape. Willie Pearse Park was a green field site with existing trees and a small mound in the the middle of the field. The challenge here was to build a playground that would incorporate the existing trees and also to make use of the hill mound. We used crooked Robinia wood for most of the play items. We further enhanced the hill using the excess soil from the safety areas of the play items and we then set our unique hillslide play unit on it. The challenge was to fit the play equipment amongst the existing trees without affecting the root systems of the trees. The existing mature trees within the playground boundary helped to create a natural playground. • Playground to cater for children up to 12 years and of all abilities etc. The challenge was to design a creative natural play area in an existing urban style playground. Certain equipment was to remain on site such as a space net, swings, multi units to name a few but maintenance work was required to give them a new lease of life and ensure they looked part of the new playground. The existing equipment that remained was steam cleaned and repainted in natural colours so they blended in with the new equipment we proposed to install. Creative Play Solutions proposed using the change in levels and where the dividing wall once was to create a giant troll. The idea behind the troll is that it was woken open up and was climbing out of the ground (1.4m high mound). The face, ears, mouth and fingers would have been carved out of wood and by using different colours of Tiger Mulch and grass it brought the “Sleeping Troll” to life. In urban areas such as Dublin City, children find it hard to get exposure to the natural environment and one of the ways we acheived this in this playground was by keeping the mature trees and eliminating all artificial surfaces from the playground. None of the play items have enclosures which helps children to mingle and also elminates anit social behaviour. The judges were Gary Graham, Bloom Manager, DME Amenity Horticulture Bord Bia and Kerrie Gardiner, Bloom Head of Show Gardens & Horticulture. They awarded marks on a variety of criteria, including the use of plants and hard landscaping material, the extent of challenges faced by the landscaper in completing the work and the overall impression and quality of the scheme.